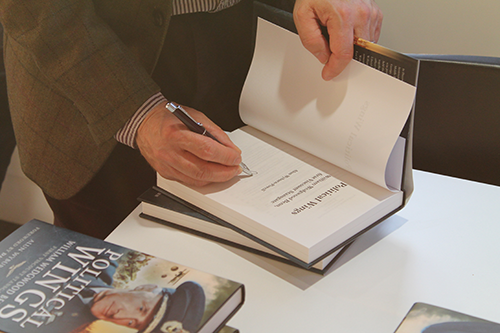 Members of the Benn family attended the launch of a new biography about one of their best-known relatives, William Wedgwood Benn. 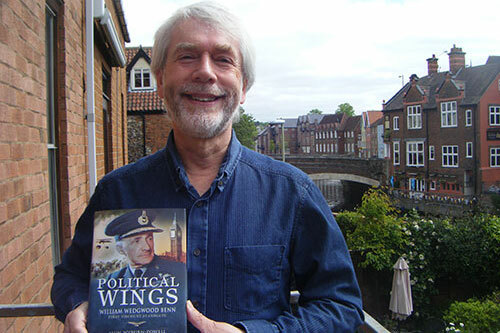 Author of Political Wings, Dr Alun Wyburn-Powell, gave a lecture about the history of the family’s political dynasty and its links to the Labour Party, highlighting lessons that modern politicians could learn from the past. The political historian, a Visiting Lecturer in the Department of Journalism, revealed similarities between Labour’s 1931 general election defeat, in which William Wedgwood Benn lost his seat, and the current difficulties faced by the party. Among the guests at the City University London event was William’s grandson Hilary Benn (right), the Labour MP for Leeds Central and Shadow Secretary of State for Foreign and Commonwealth Affairs. The audience also included David Benn, the sole surviving son of William and the brother of the celebrated Labour politician Tony Benn. During his talk, Dr Wyburn-Powell encouraged the Labour Party, as it searches for a new leader, to consider mistakes made in 1931 following the 1929 global financial crash. He said: “The choice that William Wedgwood Benn was faced with is absolutely critical in understanding what happened and I do think this is where going back and having another look at 1931 is actually very important. “In essence, it boiled down to a banking crisis that started in the United States, which indirectly resulted in government expenditure running away. By 1931, he explained, the Labour-led coalition government was forced to consider various cuts, including reducing unemployment benefit by 10 per cent, which William backed. However, after a split cabinet was unable to agree on the idea, the party lost power while being blamed for the country’s financial problems – much like in 2010. Dr Wyburn-Powell argued the party should learn from its failure to unite, convince the nation the economic disaster was not its fault and show that it was forced to continue spending. “Once the cabinet couldn’t agree, they had to resign and what everybody did after that was out of their control,” he said. The academic went on to reveal that details in his book about the middle-class background of the Benn family destroyed “myths” about their wealth, adding William was born in the East End of London and his so-called “ancestral home” was in fact a £600 “flat-pack” house bought from a catalogue. He said the title of Viscount Stansgate was created for William in 1942 and had not been passed down to him from past generations. 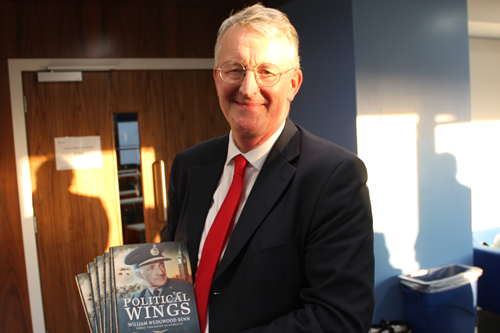 Closing the event, Hilary Benn said: “I’ve read the book and it’s an absolutely cracking read. 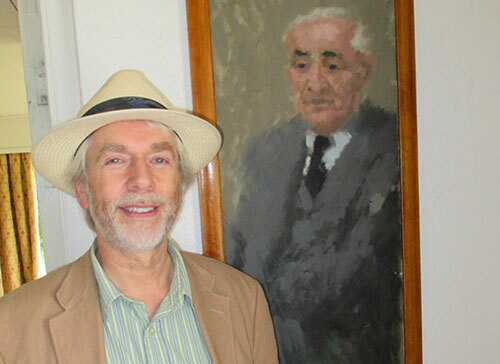 “On behalf of all of us here, I want to say a big thank you to Alun for bringing to life someone I remember as a kindly old gentleman, and whom I, like many here, would have liked to have got to know better. Dr Wyburn-Powell described William Wedgwood Benn as a “very, very diligent MP”, “exceptionally well organised”, likeable, popular and teetotal. Originally a Liberal politician, the politician defected left the party in 1927 and became a Labour MP the following year, after serving as a pilot in the First World War – making him the pivot for the politics of his children and grandchildren. He became Secretary of State for India in Ramsay MacDonald’s government in 1929 and was promoted to Air Commodore during the Second World War. In 1945, he was made Secretary of State for Air when Labour returned to power and had been an MP in four separate constituencies by the end of his career. He passed away in 1960. 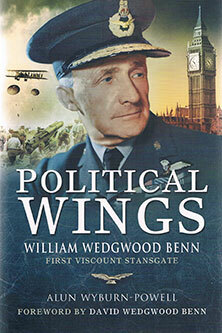 Click here for more information about Political Wings.